Blues band based its name on an original Italian drummer named Jimmy. With names such as “Jumpin’ Josh” and “Jive Willis,” you’d think these Jimmy the Weasel band members were seasoned, talented blues musicians straight out of New Orleans. You would be right about the talented aspect, but they’re located in Des Moines. Jimmy the Weasel was formed three years ago by Tom Buckmiller. The band based its name on an original Italian drummer named Jimmy. “Regarding the nicknames, we thought it would be a fun way to pay respect to the traditional blues guys and honor the heritage of the blues,” says Tom, also known as “Tbuck,” a guitarist and vocalist for the group. Jumpin’ Josh Gorman, guitar; and Blind Bill Stone on harmonica. The band plays blues, rock and soul, depending on the crowd. Favorite artists include Stevie Ray Vaughan, Muddy Waters and the Blues Brothers. 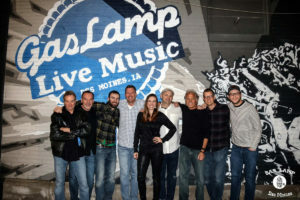 They play mostly local venues and include favorites such as Mickeys in Waukee and The Whiskey House in Ankeny. “We don’t have the typical band drama. Everyone knows their role and wants to keep the train on the tracks,” he says. Jimmy the Weasel often features other blues musicians, such as Bob Pace and Matt Woods, adding to the band’s strength. “When one musician is doing a solo, others really listen. It’s not showmanship or one-upping someone else. It’s like icing on the cake,” he says. Most band members have day jobs. Tom is a professor at Drake, Sara is a family physician and Mike is a music director. Their current drummer is in his 50th year of drumming. The band is appreciative of its fan base, called “Weasels.” Regardless of the crowd, they enjoy intimate venues where they can interact with fans and bring them on stage.